Hempstead Early Childhood Center is hosting parent classes to share information with parents on what the students are doing in the classroom. The teachers and staff are providing information on activities to help parents engage their child at home in learning for academic success. At the parenting class held on Wednesday, February 6, teachers shared ideas to help the young students learn their numbers, letters, and shapes through simple activities parents can make at home using things they already have on hand. Gloria Diaz De Vargas, along with Amy Finch, JoKeisha Campbell and Juana Herrera shared information that they were using in the classroom to provide learning that is both interactive and cognitively challenging. Throughout the presentation, they gave examples of how to make the simple learning aids at home. 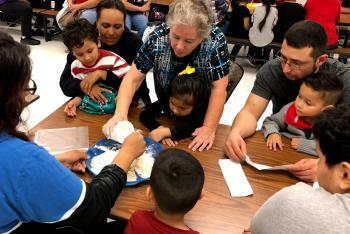 After the presentation by the Pre-K teachers, the staff worked with groups of parents and students to make homemade Play-Doh using basic household ingredients including cooking oil, cream of tartar, flour, salt, water and food coloring. Students have fun learning as they make letters, numbers and shapes with the play-doh, improving their cognitive and motor skills along the way. HECC Principal Stacey Baughn-Hunt encourages parents to get involved with their young students. The next parent class will be held on Wednesday, February 27 at 5:00 p.m. and is open to all parents of Pre-K students at HECC. Contact the school for more ways to get involved. Parents, staff, students and community working together at Hempstead ISD...One Town. One Team. One Goal.